2019 is here and it’s the start of a new year! Like many people, you’ve probably given the upcoming year a certain matter of thought, and perhaps you’ve asked yourself if there are any specific goals you have or any changes that you’d like to make. Certainly, New Year’s resolutions are a great way to set about accomplishing worthy goals for yourself and as a means of self-improvement. Some of the more common resolutions involve weight loss, exercise, and financial improvement. However, for some people a very serious personal concern that is always brought up around this time of year is smoking, and their resolution to stop smoking. While the dangers of smoking have been well publicized and are certainly no secret among the general public, tobacco smoking remains a persistent issue that continues to plague people from all walks of life. If you’re a smoker, please consider putting “Stop Smoking” at the top of your New Year’s resolution list this year! Simply put, tobacco products (particularly cigarettes) ruin your body. Although the damage takes a number of years to fully progress, smoking will slowly begin to attack your body in a variety of different ways, effectively decimating your overall health and ultimately resulting in death. While this may sound a bit melodramatic, as of January 2018 The CDC (Centers for Disease Control and Prevention) reported that an estimated 480,000 deaths in the United States occur each year as a result of cigarette smoking. Therefore, this habit is causing more deaths annually than HIV, drug and alcohol use, and automotive accidents combined! As the culprit behind these staggering statistics, cigarettes are without question the most dangerous of tobacco products due to their highly addictive nature in addition to the numerous cancer-causing substances they contain. With users addicted to cigarettes, consistently exposing themselves to harmful substances, the occurrences of eventual health problems are inevitable. While many people are aware of the adverse effects smoking has on your respiratory and cardiovascular health, the effect it has on your oral health often remains overlooked. Unfortunately, this is often a costly mistake, as smoking can have a major impact on your teeth and gums and can even trigger some serious illnesses. While certainly cigarette smoke can cause significant staining and discoloration of your teeth due to the vast quantities of nicotine and tar in each cigarette (usually giving your teeth a sickly yellowish hue) smoking also triggers and exacerbates a condition known as periodontal disease. Periodontal or gum disease is an infection that originates within the gum line and spreads throughout the mouth irreversibly damaging the gum tissue and teeth. In turn, the damage caused by periodontal disease may result in bone loss or even cause the infection to spread. In addition to gum disease, tobacco smoke can also trigger mouth cancer, which like any form of cancer, wreaks havoc on the afflicted area while always presenting the threat of metastasizing into other regions of the body. As a longtime practitioner in professional dentistry, Dr. Kimes echoed much of this when asked about the subject. “A person’s mouth is not meant to be ingesting smoke, it damages the gums, the teeth, the tongue, the jawbone; everything! I’ve had a several patients over the years who wanted to quit but just weren’t able to, it was very sad to see” he said solemnly. Indeed, the residual affects on the lives of those impacted by smoking is a very sad and very real consequence of smoking, and perhaps underlines the true importance to stop smoking more than anything. Finding the best way to stop smoking is always a tricky subject as there is no magic formula or fool-proof plan to ensure this happens. However, there are plenty of resources and different methods to assist you in the process of quitting! Make a Plan: If you are serious about wanting to stop smoking, it’s a wise idea to have a sort of game plan in mind to assist you and anticipate any difficulty that lay ahead. Quitting can be tricky so you might try asking someone else who has quit smoking for advice. Use Resources: Although there are those who attempt to quit cold turkey, (without any assistance) approximately only 7% are successful in doing so, often with much difficulty. Fortunately, there is no need for such difficulty today as numerous products exist that can be used as effective tools in curtailing your cravings. Known as nicotine replacement therapy, nicotine patches, gums, and other nicotine substitutes can play a major part in slowly diminishing the powerful dependence instilled by cigarette smoking. Ask Others for Help: Please don’t be afraid to ask for help, as support from friends and family often plays a vital role in the success of quitting. Additionally, it may also help to consult your physician, dentist, or psychologist as they may be able to help advise you during the process, and better your chances of success. 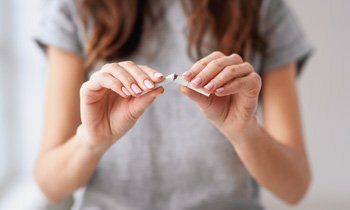 Know Your Triggers: On the road to quitting this unhealthy habit, you will probably encounter certain situations or circumstances that will give you the urge to smoke, these are your triggers and it’s important to recognize them, so you are able to refrain from smoking if or when they appear. Perhaps one of the most common triggers among smokers is the fact that they are surrounded by other smokers. If this is the case and you have friends and family who smoke, you might want to limit your time with them or make a point to avoid them if they are smoking. This can be tricky but it’s certainly worth it. Stay Busy: By keeping yourself distracted and your mind off smoking, you might find things go smoother. Put smoking on the back burner for a while and take the time to do something different. Perhaps there is a project you need to get started on or something new that you’ve always wanted to try. Starting a project or new hobby are great ways to change things up and get your mind on other things. Don’t Give Up: Quitting smoking is a long and winding road and there is always a chance of relapsing and slipping back into old habits. While this may be discouraging, it’s imperative that you not give up; even if you do have a slip-up or two (or more). By remaining consistent and continuing to fight the urge, it will get easier, you will break the habit and eventually stop smoking. The Road to a Better Tomorrow! The road to a better tomorrow starts today and with a brand-new year in full swing, the time for a healthier life is now! If “Stop Smoking” is on your New Year’s resolution list, then much like 2018 its time to make that issue a thing of the past. We hope the information above was useful for you and our staff at Overland Park Dentistry wish you a happy and healthy new year!